SpaRitual has developed 12 sophisticated Nail Elixirs to nourish cuticles, build strong nails and establish a flawless environment for color. SpaRitual Elixirs are vegan and free of DBP and toluene. SpaRitual Elixirs come with the sleek, patented Plum Cap with a signature brush for ease of opening, smooth control and a delicate finish. 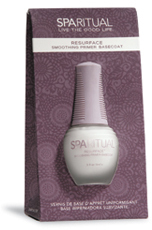 Resurface smoothes rough surfaces on nails and fills ridges to create a completely even foundation for color.